The weather wasn't the only thing that that was hot this summer! Trophies of all species were caught and released from May through September. The summer of 2018 was pretty good in terms of weather. Glorious sunsets, barely any rained out days and few mosquitos. You're probably thinking, "Wait, that doesn't sound like good fishing weather". However, you'll see by the following catches it was a great fishing season here in Northwest Ontario. The official start of 'summer' up here is the May Long weekend when the walleye season opener. We had an extra long winter this year, and many were wondering if they lakes would be open by walleye opener. Well, they opened on time and then we skipped spring and went straight into summer. Temps on the long weekend were beautiful and then spiked and gave us a heat wave followed by 4 or 5 days of cooler stormy weather. The key to fishing though is adaptability when conditions change. Luckily the fish were hungry and the fishing season started out great. Mike Becka landed this beautiful 46" northern pike on Wine Lake May 20, 2018. The fish of a lifetime! Wine Lake Camp has been practicing catch and release fishing. This means that you can eat smaller fish during your stay, but you cannot keep any trophy-sized fish. The results of this practice definitely show! Not a bad way to begin the season! Once in a while, we get to get out of the office and fish too! Alyssa, Tracey and I got to spend the day fishing with Jeff Gustafson on Shoal Lake and Lake of the Woods at the end of May. The water was so clear in the shallows we could see the crappie going after our bait. All species were biting, especially crappie, bass, walleye, and pike. June is probably one of the best months to fish. Whether it's walleye, bass, lake trout, crappie or pike, the bite is usually on. Walleye are done spawning and are hungry! With the late ice-out, anglers speculated that the bass spawn would be really late, but the heat wave in May helped keep the spawn on track. The weather in June was warm and drier than normal. The one thing we heard over and over by long-time anglers to the area was that the walleye fishing has been better than it ever has! One of the advantages of renting a houseboat is that you can travel and moor wherever you want, taking you closer to the fish. John landed this 30” walleye on Lake of the Woods near Morson while staying with Ontario Wilderness Houseboat Rentals. John, with his personal best 30" walleye! The bass were biting on the Clearwater/Pipestone chain at Hideaway Lodge in June. The chain has 11 lakes to fish. So at the end of June, this happened at Temple Bay Lodge on Eagle Lake! A muskie clamped down on a guest's northern pike. Pretty amazing photo if you ask me! July also started off with hot temperatures. But it didn't stop the fish from biting! For the most part, daily temperatures were above average and there was barely any rain at all in July. This made for nice family fishing vacations. Too hot? Just jump in the lake. There were unfortunately many forest fires in the area. Most were still able to fish their lakes, but some of the canoe routes in Woodland Caribou and Quetico Park were closed. Guests of Aulneau Peninsula Outpost Fish & Hunt on Lake of the Woods were fishing for walleye in the shallows after the Mayfly hatch. There were lots of 18-23" walleye and all the shore lunches you can eat! They were mostly biting at 3-6 feet. This is one of the fattest walleyes I have seen. It was 30.5" and 13lbs 9ozs. What a tank! It was caught at Maynard Lake Lodge on the English River System. The trophy catches continued all summer long for Maynard Lake guests. Massive walleye caught at the beginning of July at Maynard Lake Lodge. August, like the rest of the summer, was hot and dry. We had a heat wave mid-August that had you jumping in the lake between casts just to cool off. The last week of August turned stormy and cool for a few days (at least we got some rain!) and had the fish all over the place. Trees seem to be turning a bit early this year, probably due to the lack of rain. Can you say M-U-S-K-I-E? John landed this fat muskie on Eagle Lake at Stanley's Resort at the beginning of August. The muskie action continued throughout the month on this well-known muskie lake. The girth of this muskie is out of this world! A guest at Separation caught this 36" burbot (ling) while fishing the English River system at Separation Lake Camp. They are not all that common up here, and to see one this big is awesome. Have you ever caught a burbot in Sunset Country? On August 25, Kathy Link caught and released this beautiful 51.5" muskie at Delaney Lake Lodge on the English River System. The same day Bob Kloeckner a massive 53.5” muskie! The perch bite was on in August at Pipestone Point Resort on Lake of the Woods! Labour Day Weekend was fairly decent. From there, for the next two weeks, the weather varied from scorching to quite cool. This had the fish moving around to unexpected places. After a high of 29-30C (84-86F) on September 16, the weather shot down to a high of 10-11C (50-52F) and for the last two weeks of September, the weather remained way below normal temperatures. While the fluctuating weather patterns made it a bit more challenging to find the fish, once you found them, they were hungry! Despite the erratic weather, Branch's Seine River Lodge in Atikokan, Ontario reported that guests have been catching BIG fish this year. And September was no different. September bass and pike fishing at Branch's Seine River Lodge! Since they are fall spawners, lake trout fishing closes September 30th and does not open again until January 1st. September is a great month for fishing lakers. Here at Sunset Country we were fortunate enough to go out on the lake with pro-angler Jeff Gustafson in late September. Jeff took us to a place that just a few days earlier they were catching trout left right and center. Looking at the sonar, we saw so many trout beneath us. However, they were not biting! It's one thing to not have the fish biting, but when they are coming up right to your hook and deciding "No, I'm not going after that", it is so frustrating. We did, however, land three really nice lake trout that day. 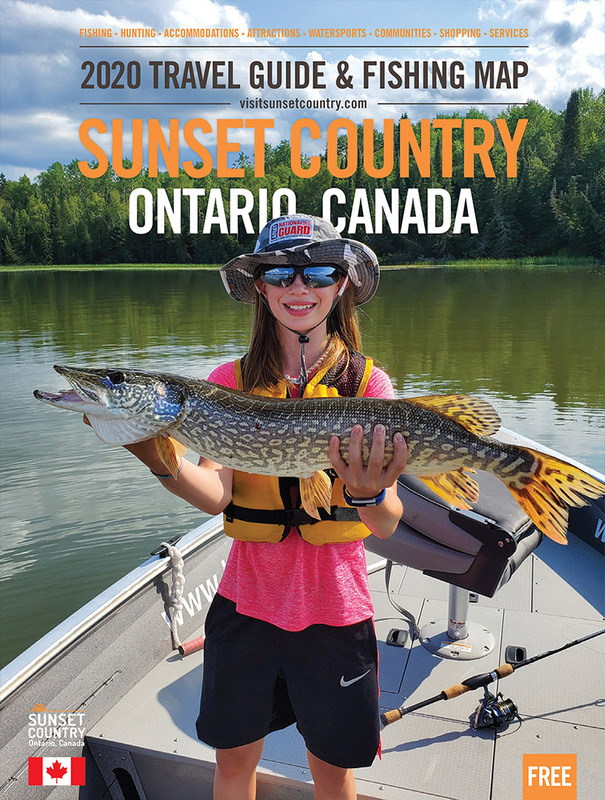 So, all in all, the fishing was fantastic in Ontario's Sunset Country this summer. How was your time fishing in Sunset Country? Let us know by posting your photos on our Facebook Page or in our Facebook Fishing Group. We'd love to see them.